Quick Definition: Public goods are goods or services that are non-excludable (meaning you can’t prevent people from using it) and non-rival (meaning it doesn’t cost any more to supply an extra person) therefore they are provided by the government. Public goods are goods and services that aren’t provided by the private sector because they aren’t profitable so instead they are usually provided by the government. 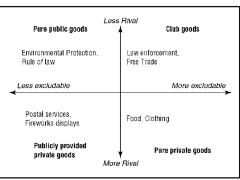 There are two main types of good: private goods and public goods. A private good (the most common type) is generally a good that is consumed by one person and therefore cannot be consumed by someone else. A car, for example, is a private good because whilst driving a car, no one else can use it (with the exception of the passengers). Firms want to sell private goods because people are happy to pay for them and therefore firms are able to make profit. On the other hand a public good is a good that, once provided, is available for anyone to use and consume. A typical example of a public good is street lighting. Once street lights have been provided, anyone can benefit from them for free and because of this, firms cannot sell them. As a result the government will provide public goods and finance this by taxation. What makes something a public good? Non-excludability – One they are provided, public goods cannot be excluded from anyone. For example, once street lights have been built there is nothing stopping people from using their light without paying for it. Non-rivalry – Once someone uses a public good, it doesn’t stop anyone else from using it as well. For example, each time someone walks under a street light and benefits from the light, it doesn’t stop the next person benefiting. External benefits – There are some goods that are non-excludable and non-rivalrous but aren’t public goods because society doesn’t benefit from people consuming them. Public goods are provided by the government because society as a whole benefits from their consumption. Let’s take our street light example again. Society benefits from the provision of street lights because streets are safer, there is less crime and people feel safe to walk around later at night. Public sector – These are the areas of economic activity which are directly controlled by the state. E.g. the defence and legal system.